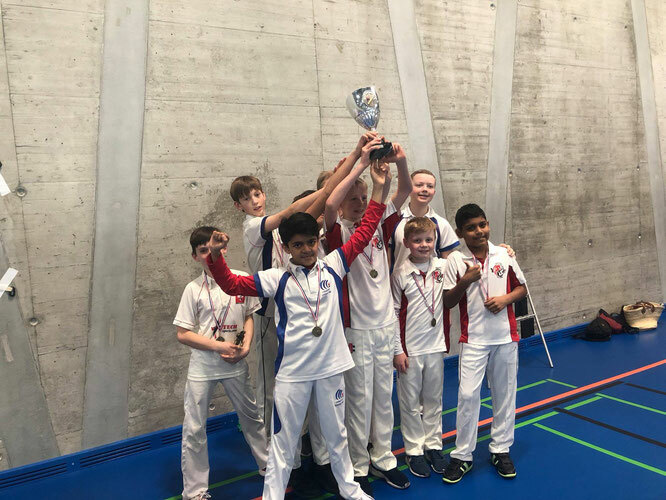 On the weekend weekend on Saturday 30th & Sunday 31st March 2019, Basel hosted the U13 Basel Indoor Tournament, where teams from around Switzerland and a team from Luxembourg competed for the prestigious trophy. Saturday consisted of two pools of 3 teams playing 20 over matches. Pool A included Gingins, Swiss U11s and a combined Basel/Cossonay team, this was a competitive pool with Basel/Cossonay beating both other teams, the Swiss U11s getting a win over Gingins. Some pundits considered Pool B the group of death which included Zurich, Le Chat and Luxembourg. Luxembourg managed a close fought win over Zurich, then Le Chat beat Luxembourg... Zurich ran Le Chat very close in the final pool game, almost setting up a 3 way tie in the pool, however Le Chat came through in the end, to beat Zurich and take top spot in the pool. 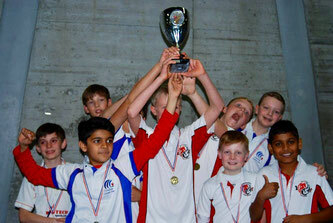 Sunday was Finals Day, first up Gingins and Zurich competed the in the Bowl Final. Zurich put on 204, with Hayden Meyer scoring 39 off 27. In reply Gingins were bowled out for 82 runs, with Josh albrecht taking 4/5 including a hatrick, so Zurich winning by 122 runs. Next up was the Plate final between Luxembourg and the Swiss U11s, the average height difference between the teams was 23cm. Swiss batted first and got off to a solid start with a 50 partnership between the opening pair of Avneet Singh and Connor Walden, however the extra bounce and pressure of the playoff resulted in a collapse and the Swiss youngsters getting bowled out for 74. 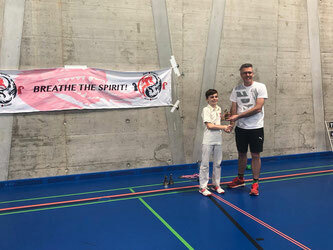 In reply Luxembourg knocked off the runs in just under 10 overs (Lydie Wykes 19) taking 3rd place in the tournament. The much anticipated final between Le Chat and Basel/Cossonay lived up to all expectations. Basel/Cossonay batted first and after a mini collapse up front, due to some aggressive fast bowling from Kai Salama (2/13), 100 runs did not look likely. However Thomas graves anchored the lower order, with 30 from 20, with invaluable contributions from Ryan Scanlon, Dev Tiwari and Vignesh Mukandan, to take them to 174 all out. In reply Le Chat started well enough with Kai, Thomas Anderson (31) and Louis Brittain (22) keeping Le Chat ahead of the required run rate. 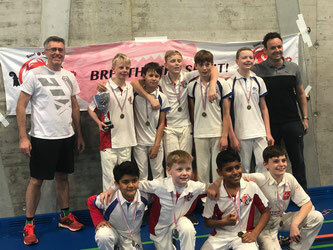 The Basel/Cossonay team maintained the pressure and energy in the field and got a couple of wickets, but it was the pair of leg spinners (Greg Veal and Ryan Scanlon) that brought their team back into the game in the middle of the innnings. With Thomas Anderson anchoring the innings he started running out partners, it came down to the 16th, over with Le Chat needing 7 runs and Basel / Cossonay needing one final wicket. The tension in the hall was palpable, with many parents unable to watch. Charlie Grimes, as captain, took the responsibility by bowling the 16th over and with his second ball took the last wicket, clean bowled. 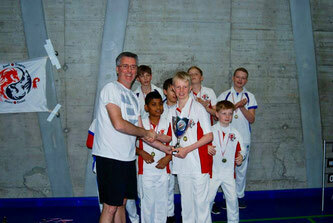 The combined team of Basel/Cossonay won the final by 7 wickets and were awarded the U13 Basel Indoor trophy. Best fielder: Austin Jennings - good all round performance with a right handed blinder fielding at square leg. Also notable, Nicky Hardings reaction catch off the wall. Best batter: Connor Walden 78 runs off 55 balls. Also notable Louis Brittain 74 off 59 and Kai Salama 67 off 42. The tournament was played with a great spirit between the teams with high quality cricket all round. Once again the matches were all scored electronically, thanks Michael Hall for setting it that up and to all the scorers who adapted quickly to the new technology. Thank you to all the teams who travelled from afar to the tournament. We are now all looking forward to the outdoor season!